The Waring House sets the standard for country inn hospitality. 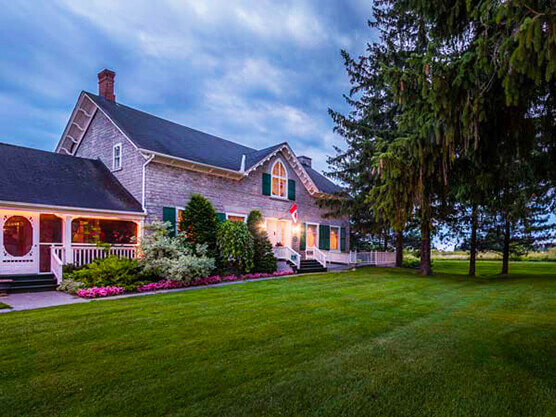 A country inn in Prince Edward County, the hotel is central to everything going on in the area, whether it’s great wineries, trend-setting restaurants using fresh, locally grown ingredients, artists and artisans, fabulous beaches or just breath-taking scenery, the Waring House offers a convenient location to experience all Prince Edward County has to offer. There’s lots to do on the property. We have two popular restaurants, The Barley Room with casual pub dining and live music on many evenings and Amelia’s Garden, a celebration of seasonal and regional cuisine. Our beautiful gardens and large banquet hall make us a sought after destination for country weddings and our cookery school, gives guests and locals alike a chance to learn tips and tricks used by professional chefs. The hotel offers many unique rooms, furnished and decorated to reflect the period when the property was first built – the 19th century. For those who enjoy a more modern aesthetic, our premium rooms and suites, found in the Quaker and Heritage Lodges, offer a rich blend of modern comfort and rural charm.